Sorry about the delay folks, just recovered from my Star Wars hangover. In addition to the movies on Spike, I indulged myself in a little Legacy of the Force. Ah, what a weekend. What made the weekend even better was to learn that the Trilogy drew more viewers than the Rings trilogy. I like the Rings trilogy but to put it head to head with Star Wars was complete madness I tell ya -- MADNESS! I'll take Jedi over Hobbits any day. Something else that came of the Prequels being on TV is the fact that my 2 year old, for the first time not being prompted, asked to watch Star Wars. She wanted to know about the characters, the star ships and seemed to really take a shine to R2-D2. Every Dad is sure that his youngling is the smartest thing in the world and mine proved she is a brilliant little one. Even she turned her nose up at "The Phantom Menace". Don't get me wrong, Kitster is so wizard but a lot of ground was left unexplored while trivial stuff was beaten to dust. I know I'll have people who question my love for the Saga after voicing a negative opinion of "Menace" but it has it's place. 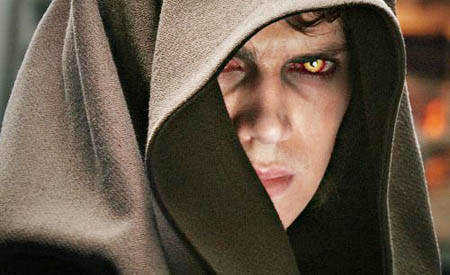 I liked the flick but thought Anakin should have been older. It would have given us a chance to see a little more the Sith and a lot less sugar. But every saga has a beginning I guess. For those of you that new to my blog, greetings and thanks for stopping by. Leave comments on the blog or drop me an email at cgardner@bannergraphic.com; I'd love to hear from you.